Hotel rooms, shopping centres, factories... these are functional places, not usually thought of as interesting to the outside eye. But without them life in the city would be uninhabitable. Their ubiquitous, parallel existences the world over mean these places are instantly recognisable, each modelled on similar rules but displaying a local face. For “Ciudades Paralelas”, Lola Arias and Stefan Kaegi have invited several artists to devise interventions into these kind of spaces. Eight artists have each chosen a location in the city as observation stations for urban phenomena. 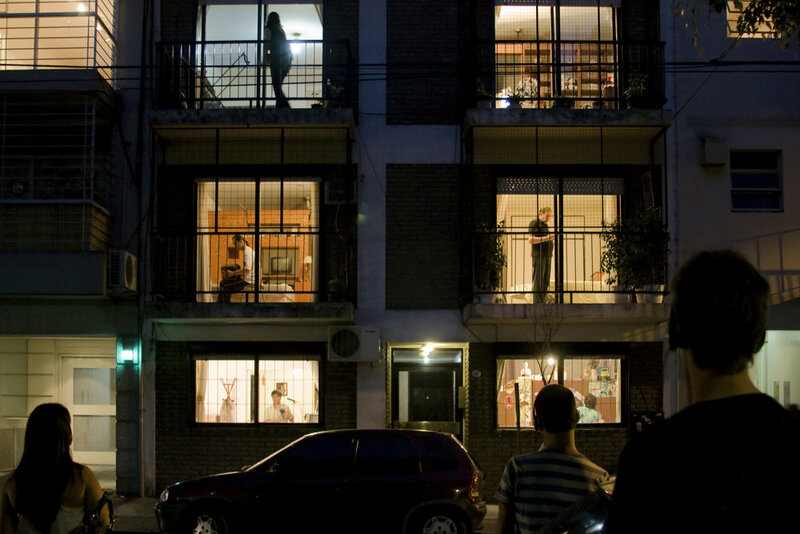 Dominic Huber stages the inhabitants of an apartment block, and positions the viewers on the other side of the street. Like detectives investigating a crime never committed, they can spy on the residents and hear their conversations.